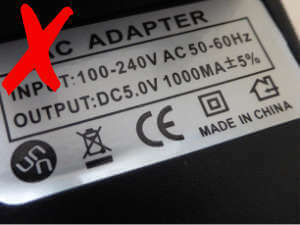 The CE mark is a mandatory conformity mark for most electrical items sold within Europe. 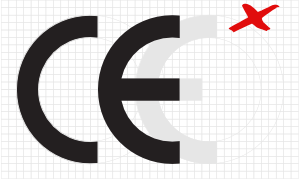 CE marking is self-certificating; the manufacturer or importer assess the product against relevant EU safety standards and signs a Declaration of Conformity. 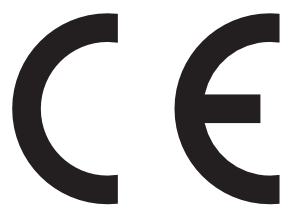 The CE mark should not be confused with an approval mark by an independent organisation, it does not guarantee the product meets the relevant safety standards. However, looking for the CE mark during a PAT inspection is important. The CE mark is widely abused, especially on cheap Chinese imports, and this can help identify possible counterfeit and dangerous items. There are specific requirements on the CE mark itself. It must be at least 5mm high and the proportions must be kept the same as the image shown in fig.1. 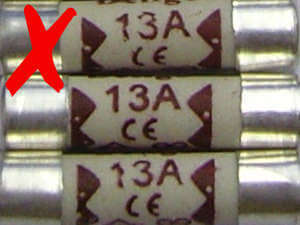 Similar non standard CE marks are often found on cheap Chinese products and has been dubbed the ‘Chinese Export Mark’ (fig. 2) The European Commission have confirmed that no such official Chinese export mark exists and is simply an example of misuse or fake CE marking. 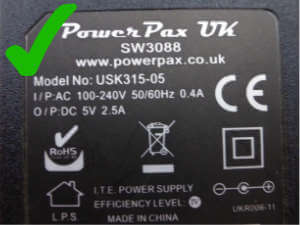 It’s thought that some Chinese manufactures deliberately use this logo in order to refute any claims that they have faked the real CE mark on non compliant products. Finding a non-standard CE mark during the PAT inspection is a good indication that the item may not meet the required standards. A reliable manufacturer or distributer that has assed the product conformity and gone through the technical process, is unlikely to then use the incorrect marking on the product. 1) Will have a noticeable space between the C and the E.
2) The centre line on the letter E will be shorter than the ones above and below. 3) Will be at least 5mm high. 4) The thickness of the lines will be in proportion to the overall size. 5) Will be in close proximity to the name of the manufacturer or distributer. 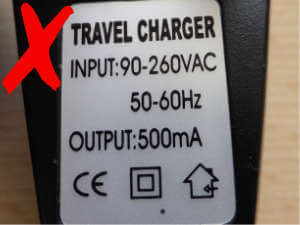 Fake CE marks are often found on items like mobile chargers. 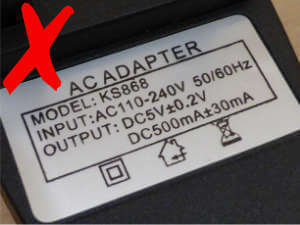 I would advise that if an ac adaptor or similar item with the incorrect CE mark is found during the PAT inspection it should be failed. These items are usually poorly made using inferrer plastics and other materials and present a significant risk of electric shock and fire. As well incorrect CE marks, you should also be aware of the incorrect usage of the CE mark. Most electrical equipment should have a CE mark, but there are some important exceptions. 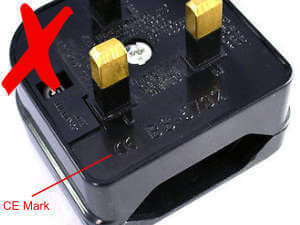 Plugs, sockets and adaptors designed for domestic use, and fuses for use in a plug or adaptor, MUST NOT be CE marked. Finding such items during a PAT test is a good indication that the product is counterfeit and does not meet the relevant safety standards.